It's almost been a year since I was diagnosed with EoE, but this diagnosis wasn't the start of my journey. My name's Emily and I'm 23 years old. My whole life I've had to live with the struggles that come with being a child/person who has serious allergies and constant ill health. When I was a baby my Mum found out that I had anaphylaxis to peanuts when she gave me peanut butter for the first time. These days’ nut allergies, especially peanut allergies are a lot more common than they were when I was a baby. Luckily, I had a Mother who had previously worked in the Dietetics department at Prince Alfred Hospital with Anne Swain in Sydney and she knew how to go about dealing with allergies. As a child, I saw some amazing doctors who taught Mum and I how to deal with my allergy. Along with peanuts, I'm also allergic to almonds, dust mites, dog dander, cat fur and soy. I am also seafood and gluten intolerant. I also have severe asthma and as a child I used to get sick quite often. Growing up with so many allergies was hard, sometimes I wouldn't get invited to birthday parties because other parents didn't know how to deal with it and didn't want to take on the responsibility. When I did go to a party my mum had to watch everything I ate, sometimes I would get the okay to have some chocolate or cake, so I would sit there and binge eat sweets and lollies because I was never allowed to have them at home. Then after every party or school event where there were other foods I would be incredibly sick all night long, crying and promising my mum I wouldn't do it again and that I was so sorry. I felt so bad that I was sick all the time and that I had to go to the doctors a lot. Heading into my teenage years I had to see my specialist more often, having to travel 12 hours to Brisbane to get to my appointment. Something my single mother could ill afford to do but had to, I went through desensitisation for my dust mite allergy which did nothing. Slowly more nut free foods were available and I thought things were good. I suffered severe anxiety while in high school and missed a lot of school due to being physically sick. However, this was just the start of many more health issues. At the end of 2014 after almost 2 years of sickness, so bad some days I couldn't move out of bed or off the bathroom floor, I found out I was born without the lactase enzyme that helps us process the lactose in dairy. I am the worst possible case someone can be of lactose intolerant. I get so sick that the pain is unbearable and I can't keep even water down. So, I cut dairy out as well. Luckily, I cook and bake a lot so making my own stuff from scratch and tweaking recipes wasn't an issue. Prior to this I'd been admitted to hospital for choking on some food at work during my lunch break. Having to have an endoscopy to remove it. I was supposed to see a speechy but after one appointment never heard from them again. It wasn't until March last year, on the day of my 22nd birthday party that I choked on a piece of chicken and after 12 hours without it dislodging I went into the hospital in what can only be explained as the night from hell. After giving me 6 different drugs the chicken moved and I was able to go home the next day. I'd only been living in Melbourne for 2 months without my family and only my best friend here. About 2 months after that I was diagnosed with EoE. The gastro was explaining it and all I heard was disease and incurable... I just wanted to break down and cry, because every few years it feels like one thing after another. My next thought was I can't have anything wrong with my throat because I'm a singer. I was reassured that the EoE wouldn't cause a problem but my constant reflux could. 4 gastroscopies and 4 appointments later, I'm on Pulmicort (corticosteroid) and pantoprozole (PPI reflux medication) and even though I have days where it's a struggle I just keep going. I live alone with 2 housemates and no family, I study music full time and my job is to bring music and happiness to babies and toddlers so that they can start to understand their own learning and development. There's nothing that means more to me than my music and singing. Some days I wake up and I'm so sick of feeling nauseous after I eat something, because it doesn't matter what I eat, it makes my stomach turn. Sometimes I'm in my singing lesson and my throat is so swollen that I can't move my larynx and it's hard to produce the sound I want. And sometimes I wake up during the night choking on my reflux because it's flaring up. I know I don't have it as bad as some other people and especially some children. I know what it's like to lie in bed when you're 8, 12, 16 because it's too hard to go to school when you can't predict if you might vomit everywhere or if you just can't process what's happening. I know what it's like to have crumpling anxiety because you've spent your whole life on edge because you don't know what's going to happen. I know how horrible other children can be, when I was 8, a group of girls thought it would be funny to give me a peanut M&M to see what would happen and laughed when I went into anaphylactic shock. Here's the thing, you don't get to choose what life throws at you, BUT you do get to choose how you deal with it and what you want for your own life. It wasn't easy for me to up and leave my family and I can tell you that every time my mother and I have to leave each other after seeing each other it absolutely breaks our hearts in two. But I want to be an Opera singer and I don't intend to let anything stop me. On the 15th of May, I was supposed to have a dilatation but it had to be cancelled after I had ongoing laryngitis for about 4 weeks. It has been one of the hardest semesters at University I've ever had to face. Being so sick constantly and then preparing for something that didn't happen. I've had to defer exams so I can get better after catching almost everything that's going around because my immune system is so depleted. But always know that no matter what happens you can do whatever you put your mind to. I chose to make sure I could do all my assessments despite what was happening. I am making the most out of what I have. The Paralympics happened because someone decided their impairment wasn't going to stop them doing what they love. So, neither should any of you. I come into my music classes every day and see the smiles on babies faces and the potential they have to be whoever they choose. And I'm lucky enough to be able to make my mark on their lives. So, remember this, only you have the power to decide what lies ahead for you, a doctor can give you the facts, they can give you statistics. But what they can't give you is the chance to make the most of your life. 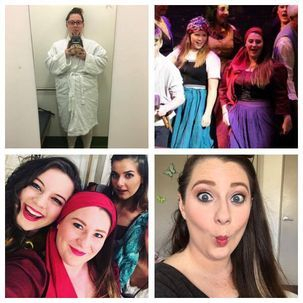 I've recently just finished my first Opera in Melbourne and managed to have a laparoscopy between two of the shows, a week after I was dancing around on stage and singing. Listen to your doctor, yes, but decide what you want and make it happen within reason. Sorry for the long story and if anyone with EoE would like vocal or singing lessons let me know, I'm also very good at makeup and cake making especially specifically catering to allergies (always nut free) so if anyone needs a hand or anything I'm happy to make cakes or do makeovers because things can get a bit crazy I know or just give advice. Thanks for reading everyone! If you would like to get in touch with Emily and/or would like to share your story with us please Contact Us.